The Planning and Zoning Commission. Taken Nov. 27. DARIEN — A long-discussed downtown development project has received its final approval, after a decision on the affordable housing portion of the plan was made Tuesday. 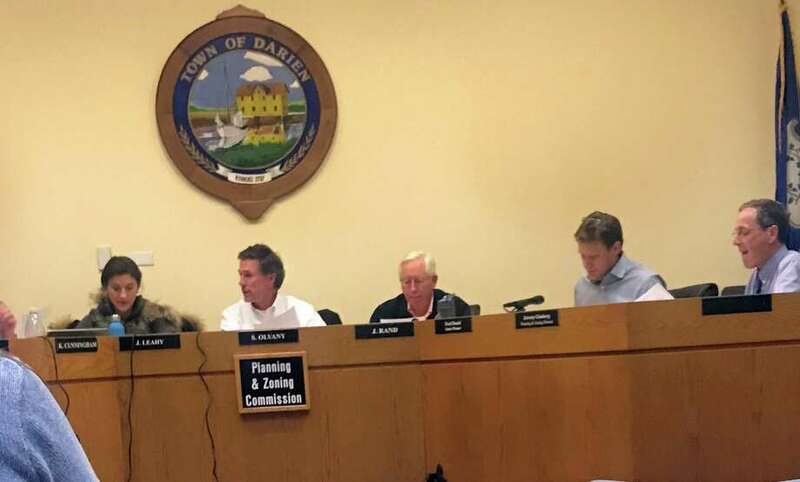 The Planning and Zoning Commission unanimously approved a proposal by Baywater Properties to demolish buildings in the Corbin Drive area to redevelop Darien’s downtown. This will increase office space downtown from 45,961 to 81,200 square feet and retail space from 52,279 to 81,730 square feet. As part of the project, Baywater’s plan to place 12 affordable housing apartment units in two buildings on 26 East Lane was also approved. Each building will be 4,500 square feet with six parking spaces. Titled the Corbin Project, the multi-use development will bring a blend of restaurant, retail locations and social spaces downtown. The project was introduced by Baywater in 2017 and will span from the Bank of America building on Post Road to the intersection of Corbin Drive and Old Kings Highway South. Comission member Elizabeth Riva said the proposal was a tough decision for her, and she appreciated everyone who spoke during the public hearing. The commission agreed to have the affordable housing designated for developmentally disabled applicants. By excluding the originally proposed senior component, members said they hoped to reduce the intensity of use. According to the commission, eligibility for the residents will be determined by Section 1-1g of the Connecticut General Statues, which defines a person of special needs. The commission also agreed to set the income limit at 80 percent of state median income, which as of 2017 was around $46,000 for an individual. Two units will also be placed downtown at 80 percent of state median income, but will not be restricted to those with special needs. Baywater will be responsible for certifying the eligbility of the occupants and relaying that information to the town. The Department of Human Services will confirm the certifications in regards to eligibility based on Section 1-1g. “Their job will be to have it on file and make sure everything is OK,” Planning and Zoning Director Jeremy Geinsberg said. Income verification of the occupants will be given to the Planning and Zoning Department and kept on file, he said. To address concerns of pedestrian access and safety issues, the commission asked that a crosswalk be added on Old King’s Highway North. Baywater Principal David Genovese has said the goal is to start building in spring 2019.